He only knows how to keep moving and to keep killing. And he will kill again unless he’s captured. Exactly 40 years ago the film “Halloween“, directed by John Carpenter, was released. A milestone in the slasher genre. It was in this film that Laurie Strode (a very young Jamie Lee Curtis) escaped from the psychopath Michael Myers in the nick of time. And so the legend about Myers arose. And now, 40 years later, the follow-up appears. 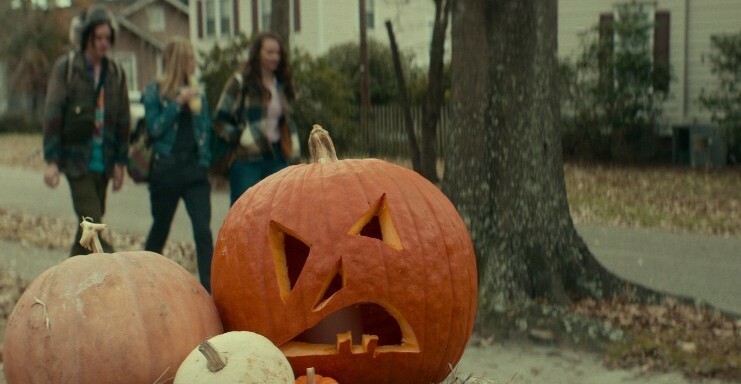 To my surprise, this is already the 11th movie in the “Halloween” universe. No idea what happened in the other episodes, because I never bothered to watch them. And even though I feared this would simply be a continuation of the same concept (and it sure is) and that I would have a “haven’t-I-seen-this-before” feeling, I have to admit it. I kind of liked this movie. Maybe this has to do with the nostalgic value of this film. Everything feels like the original film. The same creepy soundtrack is used. Even the font used in the credits has a nice old-fashioned look. Jamie Lee Curtis is also back again. Again it takes place in the Halloween period. And the masked Michael Myers bumps into fresh meat once more. And he’s eager to plant his butcher’s knife in their body. It feels like old-fashioned, old skool horror, as they appeared in the 70s. He’s coming back for sure. I only wondered about one thing. Was it really necessary to make a sequel to the famous first film? After all, you’ll know in advance that they are going to continue on the same thing and you can already predict which direction it will take. What gives new impetus is the older Laurie who has withdrawn into a house in the forest, protected by ingeniously invented systems and strategically placed spotlights. A kind of fort equipped with all sorts of gadgets to keep unwanted intruders out. There’s even a panic-room with a food supply enough to survive a 3rd world war plus an arsenal of weapons with which you can eradicate a whole flock of zombies. The reason why Laurie has installed herself in this way is of course Myers. Her paranoia about this figure hasn’t disappeared over the years and she expects that he’ll show up again someday. Extremely dangerous. Minimum security is enough. Films of this genre are usually richly filled with illogical reasoning and stupid behavior. For example, the extremely dangerous Michael Myers has been locked up in a highly secure establishment for 40 years. And during all those years, this psychopath hasn’t uttered a single word. The fact that a bunch of amateur journalists can talk to him for a moment, wouldn’t be admitted without additional measures in reality. They would be thoroughly searched so they couldn’t smuggle prohibited articles inside (like a mask for instance). But especially the fact that this notorious murderer is treated as an average patient during a transfer, could be called hilarious. An ordinary orange school bus with a few other detainees is used for this purpose. If it were me, he’d be captured in a block of concrete and he’d be guarded by a whole battalion of guards. I wouldn’t take the risk. As always, you as a viewer know what is about to happen. Not them apparently. Well, fortunately, because otherwise, the movie “Halloween” wouldn’t be what we expected. A nerve-racking slasher in which Myers scares everyone by standing motionless and emotionless somewhere in a dark corner while observing. And everyone who crosses his path gets acquainted with the razor-sharp knife he carries with him. And as always, housewives, babysitters, and teenagers will be the victims. Unfortunately, all this didn’t have the desired effect on me. It wasn’t scary. Only the inevitable final fight provides the necessary tension for a moment. 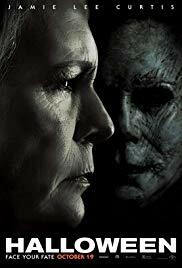 Needless to say that only Jamie Lee Curtis excels here as the stressed out grandmother who has been preparing for this confrontation for 40 years. The rest of the cast is secondary and the only reason why they are present is to raise the total number of casualties. Some characters are even annoying. And actually, it makes you happy that they are being murdered (like the bickering policemen who discussing their sandwiches). Apparently, Jason Blum wants to make 10 sequels of “Halloween“. I guess Jamie Lee Curtis won’t be in it. Because even though she still has the perfect feminine curves, she starts to look like a painting by Rembrandt. She’s slightly cracked and a cultural heritage.